He has been with us for only a short time, but it is truly a blessing to see how he fits so perfectly into our lives. MENNVILLE, Man.—We are thrilled to welcome and also introduce to you our new pastor, Michael Vanderzwaag. 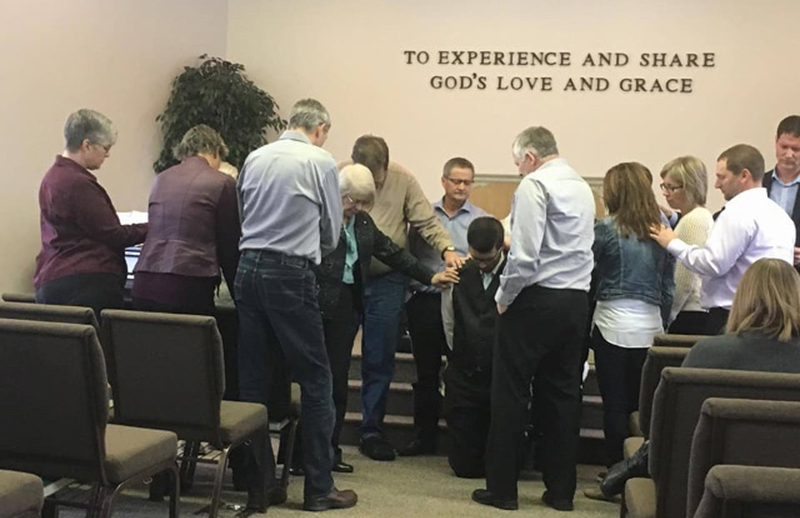 He comes to us from the Cornerstone Fellowship Church in Swift Current, Sask. It is heartwarming to hear the story of his journey and how God called him into ministry and then how that led him to Mennville. He has been with us for only a short time, but it is truly a blessing to see how he fits so perfectly into our lives. We are thankful for his youth and enthusiasm and his willingness to work alongside the present ministerial in our church. The Installation Service was held on Nov. 12 and it was such a special morning for all of us here. He had his parents Pete and Gloria here as well as Grandma Lorraine for support. Michael, Gloria, and Lorraine also did special music during the offertory. It was beautiful. Thank you so much for that! We also affirmed Michael into the membership during the service. One of the ministers here, Barry Barkman, chaired the service, and he said there were people to thank for getting us to this point. Thank you to the Pastoral Search Committee who worked hard to find someone and started the process of hiring someone. Thank you to the EM Conference who helped us connect with Michael and guiding and encouraging us. Thank you to the Mennville church family who prayed for this to happen. Thank you to Michael who obeyed the call from God to pursue this small country church called Mennville. Thank you to Layton Friesen, conference pastor, who helped us with the service. It is always a blessing and privilege when he “comes home.” Thank you to God who saw who and what we needed here and opened doors. Although our numbers have declined in the last number of years because of post secondary schooling and families relocating to bigger centres, we are alive and well and trying to be a light in these troublesome times in our corner of the world. May you have joy and peace as you serve Him in your corner wherever that might be!